Is there any movie more touching and exciting than Titanic? And the first time you watch it, it’s completely unexpected. I didn’t even want to see this in the theater, and resisted for months. Fool that I am, I figured, “Yeah, it sinks. I know what happens. Why see it? 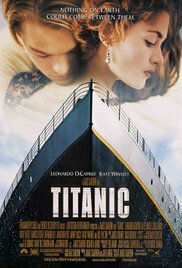 The heart of the story is Rose and Jack: actors DiCaprio and Winslet exhibit charming charisma, chemistry, and commitment to their forbidden inter-class love affair. The sparkling James Horner soundtrack helps, as well as the indelible visuals of the gigantic, “unsinkable” ship. The big screen viewing’s sense of scale draws you right now. DVDs don’t do it justice. Bill Paxton’s framing story adds the perfect storytelling device, bridging past and present in a poignant way, making the heroes, villains, and tragic deaths more meaningfully real. The old decayed ship on the sea floor morphs into the Ship of Dreams, where the “the china had never been used. The sheets had never been slept in. ” You just get chills. It’s a storytelling triumph: James Cameron went to extraordinary lengths (and expense) to film the actual submerged remains, bringing us to that forbidding, painful, fascinating setting. This sh!t happened. A cascade of small mistakes, human hubris, and major design oversights led to over 1500 people dying horribly, unnecessarily, in the far North Pacific on April 15, 1912. Through the fabulous medium of movies, at their best, you get to feel and care for real history, even if the two main characters here are fictional. I love this movie so much that I now devour any books, movies, or museum exhibits on the Titanic. Yes, I do.